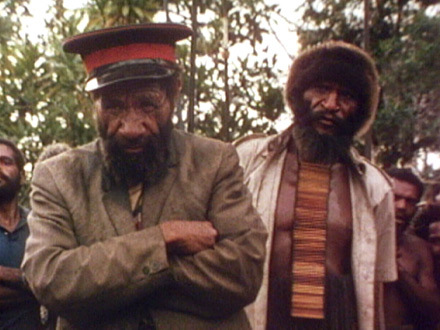 Ongka is a "bigman," a leader of a Kwelka tribe in New Guinea where a man's authority and prestige are are derived in large part by his ability to organize a lavish "moka," or gift-giving. The moka is an elaborate system of gifts which forges alliances and maintains peace among the tribes. In this particular moka, which Ongka had been planning for ten years, the gifts included 600 pigs, cattle, rare birds, a motorcycle and a truck. The gifts obligate the recipients to repat the debt with even more "generousity" so as to maintain their own prestige. The film closely chronicles this celebration, including the preparations, and reveals a fascinating portrait of Ongka himself. Description from Science, Technology, & Human Values Vol. 5, No. 32 (Summer, 1980) About the Odyssey series In an attempt to cut the often esoteric ice of anthropology, PBS released in 1980 the first season of ODYSSEY, a newly-created series of anthropological documentaries, with a second season in 1981. The entire series was produced by Public Broadcasting Associates of Boston, with major funding by the National Endowment for the Humanities. Additional funding was provided by the Corporation for Public Broadcasting and Polaroid. Michael Ambrosino is the Executive Producer of the series.